Hey guys, welcome. My name is Shay from dreamhomebasework.com. 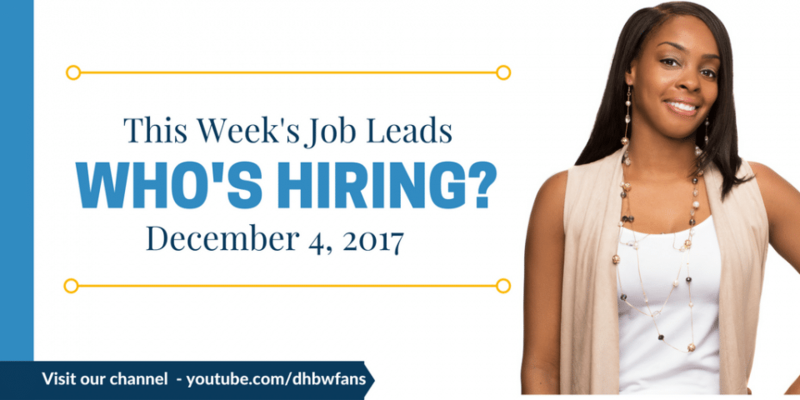 I am back this week with a brand new video with some hot job alerts. I wanted to alert you guys that there are some companies that are actively hiring and I am going to give you guys some general information and also provide some links in my description box for you guys to go online and apply. Let's get started. If you enjoyed this video, make sure you become a YouTube subscriber if you haven't already! Let's take a look at who's hiring this week…. The first company I would like to share with you guys is called voice Hub. They are hiring a social media jockey. Now, this is one of those positions that will let you work from anywhere and even the job posting says you can work from any location. Your role involves helping to company keep social media platforms updated with fresh content. That means you'll basically publish new content on their social media pages as well as monitor comments and questions on any of their social media platforms. Now, the hours are flexible. You will be able to work full-time or part-time. Now, no special equipment is needed except a computer. You can basically use a laptop, a Mac computer. You don't need anything fancy in order to work for this company. The pay is not reported on the site. However, if I do find information about the pay, I'll leave it in my comment section below. The next company is World Lingo – Read more– they are hiring translators and proofreaders to work from home. Now, some of the requirements are you must be able to write and speak fluent in English. Now, they do require you to have at least five years of experience providing translations in a commercial setting. Now, if the country you live in has a translation association for professionals, you must be able to provide proof of membership. You also must be a university graduate. This company is open to multiple countries so definitely if you live outside of the US and match these requirements, then you are able to apply. The next company is SpeakWrite, they are hiring general and legal transcriptionists. This job is open to the US as well as Canada. Now, applicants must be able to type at least 60 words per minute with a 90% accuracy or better. Now, for legal transcribers, you must have prior experience as a word processor or a transcriptionist but for general you don't need to have prior experience. This company does do background checks and the pay is around a half a cent per word, which averages to be around $12 to $15 per hour for most client contractors. The last company is Uhaul- Read more. Now, they just posted a brand new listing for part-time customer service agents. I spoke with the HR manager last week. They are doing the bulk of their hiring now before the new year. If you are looking for a part-time position, I urge you to go ahead and apply. Now, the post thing will say Arizona but you don't need to be located in the state in order to apply. They are hiring throughout the US. The starting pay is around 8 to $15 per hour based on an hourly pay as well as any bonuses and incentives you receive for upselling any products. Now, the computer equipment, you do need to have an updated computer and they will have a list of things that you need to make sure that your computer is compatible with on their application page. Now, Mac computers are not allowed at all. The one thing that you definitely want to make sure that you have is a Windows 8 operating system and also some type of antivirus program. Don't forget to follow our work at home community on Twitter, Facebook, Pinterest as well as my official blog just to keep updated with any new job leads. I hope you guys found this video really helpful. Don't forget to give this video a thumbs up if you enjoyed the information that I shared. Also, feel free to share with your family and friends that may be looking for a legitimate work at home job. Also, if you are not a subscriber, make sure you hit that red button at the bottom of this video to subscribe. As always, if you're looking for any other work from home opportunities, make sure to check out my official site, dreamhomebasedwork.com. Thank you guys for watching and take care.